This beautifully balanced Dessert Wine pours with a deep, rich red color in the glass. This colorful richness follows through to the aroma which reflects a strong, raspberry fruitiness with deep warm spiciness. The strong fruity flavors are complexed with a beautiful symmetry of warming alcohol and balanced sweetness. Our Dessert Wine took several years to create. First, we ferment several tons of Merlot to create a fresh, fruit forward wine that can be distilled quickly to retain this vintage freshness. Our distillers are the world-class St. George Spirits in Alameda, California who take this new wine and create lovely, varietal alcohol for the second part of this dessert wine creation. The following year we create a field blend of varietals to form the backbone of the wine. This, our first Dessert Wine, was created from primarily Merlot and Malbec with a bit of Petit verdot and Cabernet Sauvignon for complexity. During the most intense part of fermentation, when the yeasts are rushing to ferment the sugars of the grapes into alcohol, we add our alcohol from St. George Spirits to stop the fermentation at the sugar level we desire. This addition slows and then stops the yeast fermentation and creates our desired alcohol and sugar levels in the final wine. Finally, this wine rests in barrels to harmonize the varietal attributes and add a bit of barrel ageing to balance the flavors. This Dessert Wine was barrel aged for 34 months in French oak. 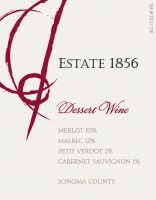 FOOD PAIRING NOTES: We would recommend that this scrumptious Dessert Wine be paired with a rich chocolate dessert. For inspiration we suggest this lovely Chocolate Cranberry Torte!